Interested in learning how to engage in community and societal level work as you address sexual violence prevention? Come learn strategies and approaches for this exciting work! 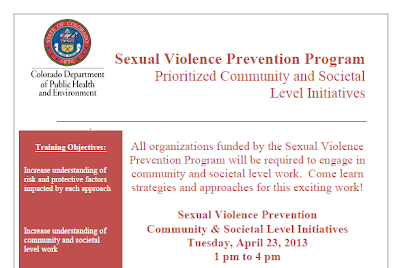 Come to the CDPHE Sexual Violence Prevention Program Prioritized Community and Societal Level Initiatives training on Tuesday, April 23, 2013 from 1 p.m. to 4 p.m. at CDPHE. Increase understanding of risk and protective factors impacted by each approach. Increase understanding of community and societal level work. Unveil the prevention initiatives prioritized by the SVP Program. Discuss what approach will best work in each unique community. Learn about funding available to support these initiatives. You can read more information about the training and how to RSVP here. We hope to see you there!